What do the Weaponized Bird Flu Hoaxers all seem to have in common? –they want you to take colloidal silver; buy it from them, drink it, wash with it, put it in the atomizer and breathe it in….. The poisoning ‘risks’ are easily knowable, but what about other purposes? The only biological use for silver (Ag) is as a drug. It is neither an essential nutrient nor trace mineral . It’s a heavy metal, a known toxin, and “the exact mechanism of Ag toxicity is unclear“. It is common to find ‘dose’ recommendations on product sales websites equivalent to 10 to 30 ppm. At this dilution, a silver solution is conductive for electro-chemical applications. Is it odd, d’ya think, that the people promoting the pandemic and selling colloidal silver are also trying to warn you about ‘frequency weapons’? Silver is one of the most electrically conductive materials known, used in microcircuitry and ‘wave guide’ technology for its ability to control and transmit radiofrequencies. Colloidal metals are artificially created ‘nano-particles’, ultramicroscopic, and their purveyors wish you to know that this is what makes them effective. Effective to do what? According to www.microbecide.com, “This advanced molecular technology allows us to engineer Microbecide with higher stability and create a molecular bond that makes the silver ions more bioavailable, dramatically increasing their antimicrobial action…(Uptake): the organism is attracted to the organic acid base [citric acid component] of Microbecide as a carbon or food source, taking up the silver ions. Silver ions readily bind with electron donor groups (enzymes) blocking the cell respiration pathway and interfering with components of the microbial transport system. Silver ions disrupt the metabolic and/or structural proteins on the organism’s cell membrane causing lysing (bursting of the cell wall). Silver ions denature the cells DNA or RNA halting metabolic and reproductive functions.” This product claims to be “effective even against resistant strains of microbes.” Microbecide was not designed to be ingested, however, “In the case of young children’s toys or equipment, it is recommended that Microbecide be applied before and after each use.”…..”safe, nontoxic,…to people, plants, and animals.” But very deadly to microbes. We are 90 percent microbes. Killing them is killing ourselves. 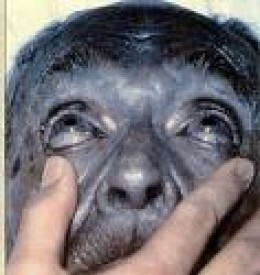 “Argyria” (pictured) is just one effect…..
How did colloidal silver ever gain a classification as a “dietary supplement”? The wikipedia says that “dietary minerals are the chemical elements required by living organisms…The term ‘mineral’ is archaic since the intent of the definition is to describe ions, not chemical compounds or actual minerals.” http://en.wikipedia.org/wiki/Micromineral. ‘Ions’ in this context refers to “free electrons” or atoms with an electron imbalance which can also be described as free radicals. Free radicals, in turn, can be corrosively damaging to cells if they are not usefully neutralized by antioxidants (electron donors). Does this sound “safe” to you? Does it sound “non-toxic”? The makers of “MesoSilver” (www.purestcolloids.com) want you to think that “silver particles are non-toxic to humans” and that you will be “Feeling Worse Before Feeling Better” –what they call a ‘Herxheimer reaction‘– and that their superior product is “true silver colloid…not silver ions” because “Many products are advertised as being colloidal silver, but in fact are mostly ionic silver solutions“. The colloid is actual metal particles suspended in solution. –but silver is not is a nutrient micromineral, established by every known encyclopedic reference on nutitional minerals, AND it is mechanically processed from mined-and-refined ore.
Why would the Australians consider colloidal silver use “a significant public health issue”? The answer in part is an emerging array of silver-resistance in common bacteria. Overuse and abuse of antibiotics, such as the daily drinking of silver disinfectant, creates a population of users in which superbug strains can be expected to emerge and put the entire population at risk. There is a begging question here. If bacteria can develop silver resistance and pass on the sil-gene, are there other metals from which this genetic mutation will protect the bacteria? Will sil-genes become useful pieces of DNA in the creation of biological metamaterials for nanomachines? And, the last, unanswerable question remains about the electronic properties of absorbed silver. Silver-ion selective electrode technology is used in electro-chemical sensors and computer-based instrumentation. At this website a formula for electrode solution is determined by “serial dilutions of the 1000ppm standard solution” citing those (implied) dilutions at 10 to 30ppm, then mixed with a buffer. 10-30ppm are precisely the ‘dose’ recommendations for ingestion. Is this seriously dangerous? Abstract. Nanosilver is increasingly used in the food industry and biomedical applications. A lot of studies have been done to investigate the potential toxicity of nanosilver. But information on whether or how nanosilver particles bring changes in genetic materials remains scant. In this study, the replication fidelity of the rpsL gene was quantified when nanosilver particles were present in polymerase chain reactions (PCRs) or cell cultures of E. coli transformed with the wild-type rpsL gene. Three types of nanosilver (silver nanopowder, SN; silver–copper nanopowder, SCN; and colloidal silver, CS) were tested. The results showed that the replication fidelity of the rpsL gene was differentially compromised by all three kinds of nanosilver particle compared with that without nanosilver. This assay could be expanded and applied to any other materials to preliminarily assess their potential long-term toxicity as a food additive or biomedical reagent. Moreover, we found that nanosilver materials bind with genomic DNA under atomic force microscopy, and this might be an explanation for the compromised DNA replication fidelity. After posting ‘Colloidal Silver’, a barrage of flak came my way which I wrote about in the post “Imposters and Hell-hounds” (see Quick links, blog index). I’m pursuing this subject further and the people behind the people…so far, very intriguing. Researchers of ‘NWO’ will recognize “paid opposition” –there’s a lot of money here with ‘alternative’ health (not necessarily ‘natural’ health as they would like you to believe) fronting international business consortiums who are controlling world conservation areas and implementing “debt-for-nature” schemes of the World Bank, et.al. One of the more eye-opening discoveries about CS is that the major manufacturer/distributor of bottled CS known as American Biotech Labs has a chain of ownership to former executives of Homeland Security… go figure. That’s a very serious statement to make if it were true, but if it were not true, then it would be a highly erroneous and reckless thing to say, as it plays directly into the hands of the current crop of colloidal silver debunkers (aka pharmaceutical shills) who are flooding the internet with wholesale hokum about the many “dangers” and “toxicities” associated with colloidal silver. One such pharmaceutical shill is someone who calls herself Jennifer Lake of https://jenniferlake.wordpress.com/. Her August 17, 2009 blog posting is a virtual tour de force of condemnatory statements that would scare off even the most commited supporters of Nature-based medicine–if her statements were true–but since her highly deceptive rant is riddled with FALSEHOODS and contrived “scientific studies” paid for by the hidden hand of Big Pharma, it stands to reason that a physician, like Dr Joseph Mercola, who postures himself as a champion of natural medicne, needs to exercise far greater caution in making such alarmist statements about a subject of which he is obviously uninformed. Look at the technology of metal “nano bar codes” (Nanoplex Technologies Inc) in the food chain http://citizen2009.wordpress.com/nano-food/ In addition to that, I’ve been reading up on nanocomposite ‘edible’ plastics and micro-silica (self-assembling polymer) additives — sounds like the ingredients of semiconductors being passed in food! This is not unlike many colloidal marketers who advertize that their silver products target only the bad bacteria, which makes about as much sense as bullets that kill only bad guys and pass through the good guys without harm. We are not engaged in commerce. Send a donation as a US postal money order within the USA. Leave all spaces BLANK on the U.S. postal money order you send as a donation. Do not write my name, your name, or any other information on the postal money order and leave the stub attached. Make a copy of the entire money order and keep it in a safe place. I immediately mark the amount of the donation as well as the premium gift items requested on your envelope when I first open the mail, so you can be sure that I have a record of the amount you sent. For your protection, I never enter names, addresses, E-mail addresses or telephone numbers into my computer. I only write your contact information on your envelope itself and nowhere else. As a backup, you can always stick a Post It note on the postal money order (or paper clip a piece of paper) with the your name, address, date, and amount sent as a secondary paper trail, but leave the money order itself BLANK. I am no longer in the banking business and now use U.S. postal money orders as a safe way to pay bills, etc. I hope you can understand. It’s a good idea to wrap your money order in a single layer of aluminum foil to make it invisible to X-ray machines or human eyes and place inside a folded sheet of paper, which can be your itemized list for premium gifts or the body of our e-mail exchange, etc. If you feel comfortable about it, include a phone number. If there’s a problem, it’s much faster to just call you on the phone rather than go through the e-mail rigamaroll. .
Failure to follow these instructions will result in the return of your donation for correction. For orders outside of the USA, send me an e-mailwith your request and I can provide information for making donations. When you send me your e-mail to confrim postage, list the items you desire in a numbered sequence-listing the specific name of the desired item, the suggested donation, and the subtotal for the entire order . E.g. Tell me what state you live in and the ZIP code or what country you live in so I can calculate the postage. Outside the USA, I just need to know the name of the country. If I have the item on the shelf and ready to go, I can usually send within a few days of receipt. Please note that I mark the date on all mail when I pick it up from the post office. The “delivery clock” starts for me from the pick up date, not from the date that you sent the mail. On average, it takes 4-7 days for First Class mail to be delivered to my post office box from within the USA, and a little longer for overseas mail, unless it was sent by Express or Priority delivery. The Colloidal Silver subject is ongoing in the blog https://jenniferlake.wordpress.com/2009/10/17/every-silver-lining-has-a-black-cloud/ ; remarkably, through the heavy promotion on ‘Patriot’, ‘conspiracy’, ‘truther’ and ‘alternative health’ websites, urging self-medication with CS, I’ve determined its a ploy –a plot– to destroy the health of an active and outspoken segment of dissenting citizenry who protest the elimination of our constitutionally protected civil rights. Makes one wonder about the ingestion of Nano Silver products such as “Super Silver Solution” and “Silver Biotics” (as opposed to colloidal silver). The confusing thing is there’s supposedly proven research as to its effectiveness. They present a very good case yet its still heavy metal no matter the size. A very eye opening article. I am fairly knew to the alternative media, it has been about a year and a half. But I was very suspicious of all these colloidal silver advertisements. I am glad you talked about microbes as well. I have learned that all this anti-microbial soap that is out there is bad for our natural immune system. I buy organic soap at Whole Foods market. We also should stop giving anti-biotics to our chickens and cows. It’s funny recently I was in whole foods and they had a new “pro-biotic” drink that contained chlorella. Maybe I will try it next time. Incidentally, I received my weekly issue of American Free Press newspaper in the mail today and saw an article about a defeated attempt by ConAgra at trying to put a microchip in every livestock on family farms. It was called NAIS, the national animal identification system. During the Bush Administration, Jay M. Cohen the Secretary of Technology for Homeland Security wanted to put a micro-chip in every American citizen. Can I suggest you add “living” (fresh, raw) and cultured foods on a daily basis and help rebuild your beneficial flora? Then look into a sensible metal detox protocol that chelates these poisons and helps you clear them from your blood and tissues. It takes time, probably many months, so keep a good intake of protein and fat in your fresh diet. I’m told algae and fatty raw seafoods are good for this. Also, read “Healing with Milk” on this blog. Dr. Banks suggests a therapeutic antioxidant –glutathione (available in precursor form as n-acetyl-cysteine, or NAC)– to help restore the energy of your cells. I wish you all the best in regaining your strength. I just read your 2009 article on colloidal silver with great interest. Have you covered colloidal gold yet? Fantastic claims of spiritual awakening and extrasensory communication associated with those hawkers. Makes you wonder why they are not being forced to take their claims or products away? I posted this at http://www.polioforever.wordpress.com/dr-marys-monkey/ . Note the text : “When the condition is hopeless..” and then explain how “shortening a terminal” and hopeless illness prolongs life. ?? My daughter had suffered from chronic ear infections for many years. When she was 7 years old, after reading all the miracle stories about colloidal silver, I decided to start giving it to my daughter. I cannot say that it helped her infections. But what became very apparent is that my daughter, who was a bright and happy kid, started having difficulty with her speech. She would stutter, not recall simple words, and take painfully long time to express a simple thought. She also became very moody and depressed, often saying she hates herself. I cannot attribute these changes in her to anything other than colloidal silver. Since then I searched the internet for information about colloidal silver toxicity. I wish there was more information about neurotoxicity, its manifestations, how to test for it, and the way to treat it. The standard solution for heavy metal intoxication is chelation. Should that not also be a method when suffering from negative feedback due to CS? Hi Anthony– I would say yes to that with a caveat. A nutritionally high-value diet should be everyone’s goal which will include some natural chelators. A good diet that includes adequate raw fats, protein and cultured foods is essential. Aim to support healthy cell turnover and immunity. Depending on the degree of ‘negative feedback’ and the reason, possible short periods of intense chelation and detoxification could be very helpful, but intense chelation is not a health ‘lifestyle’ in my opinion and could end up harmful if not thought of as a medical intervention. If a disease condition is present, seek expert supervision. Most people I think just want a good maintenance strategy; even having one doesn’t prevent occasional challenges, temporary sickness or discomforts given the changing environment. Patience is a very good thing. We’re all being forced into rapid adaptations that often seem like ‘unwellness’ but may actually be a positive adaptation. A good information-gathering strategy is another must. The facts are: Colloidal silver is being introduced into our bodies and into our environment without our consent. I have many pages of documentation > including this document from the Environmental Protection Agency, which clearly specify that many forms of nano-partical silver are TOXIC to cellular biology. Wake up to some facts: Why should I or anyone else have to go through a chelation process, when I never voluteered to be exposed to this TOXIC CHEMICAL in the first place? Hey Paul– take notice, I’ve deleted a couple of your comments already from other posts. Wanna help people learn?– that’s good here. What won’t stand are threats, gratuitously foul language and long documents in toto. Help me too. There are 100,000 untested chemical compounds or so in current product use– decades in the making. Nobody volunteered to be poisoned but the result is the same if we proceed in ignorance. Individuals get into health trouble over time when they co-factor these exposures with vaccines, x-rays, dirty electricity, pharmaceuticals, and continued use of poisonous chemical products. Chelation, appropriately, helps restore a proper metabolism –it lifts the mind, emotional well-being, and the ability to recuperate, fundamentally improving one’s quality of life. I’m sure you didn’t volunteer to be born either, still wouldn’t you like a life with less “venom”? Ok. I can accept that. But I don’t find it acceptable that just because some persons are able to “feel” better about their own situations, that this has ANY positive effect on the millions who are going down in flames. This planet is being willfully destroyed under the agenda of incompetent fools, who are so mentally impaired as to think there will even be an end game. When the entire planet is dead, who wins? These idiots have been voted or paid into positions, in which they think it;’s perfectly normal to poison and exterminate the general population, like we’re just so many lab rats. Millions of tons of barium nitrate, aluminum sulfates, strontium, PTFE plastics compounds, and virulant biologicals are being dumped into the atmosphere every year. In my area alone, the local moose population has declined by 68% since 2006. Whole forests are dying off. There is a local plague of Lyme’s disease, Morgellon’s syndrome, people losing limbs and body parts from unsolvable bacterial infections. You mention ‘quality of life’? What life?